Present and justify a planned proposal for your investigation. 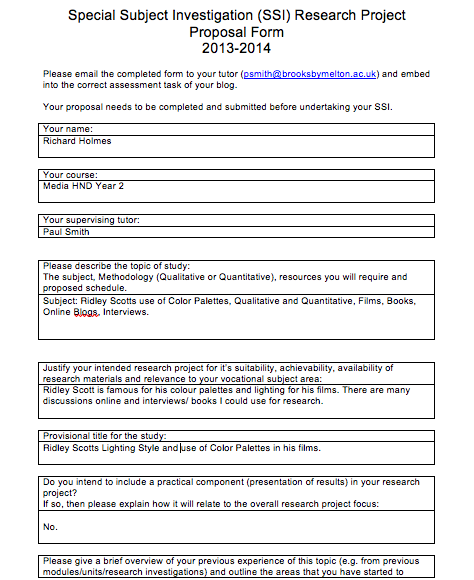 The proposal you submit will evidence your independent Investigation towards the end of semester two. For this task we were able to choose anything we were interested in within the media field. We did a Colour Grading project last semester and since then I have been looking at colours in films a bit differently. I find colour palettes in films really interesting and I now always ask, myself why these colors are selected for theses scenes and what purpose do they serve?. There are many answers these questions but I thought I’d take a deeper look into why directors choose their color palettes for their films. Also since my lighting unit last year I also wanted to analyze specific lighting styles that directors have. After talking with my lecturer Paul Smith he said I should narrow it down to one director. So I choose Ridley Scott, as he is a well established film maker that has plenty of movies with wonderful lighting techniques and color palettes. Below is my proposal form which I submitted. 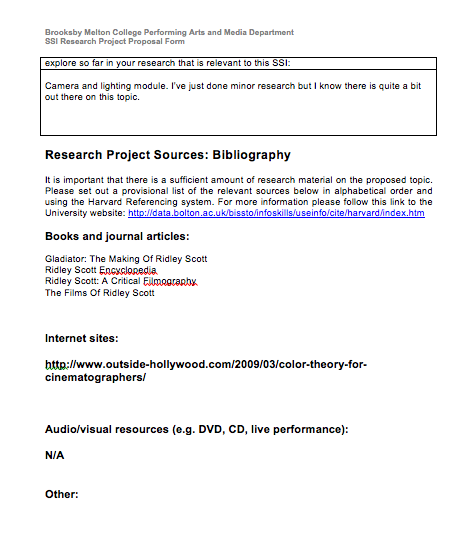 In my research proposal I had to justify that there was enough research materials out there to conduct my analysis. I found several books and websites which I knew would help me with my investigation. I decided early on that I would present this project in a video with a voiceover. I would take numerous films that Ridley Scott has directed and take specific scenes that are good examples and edit them together while discussing his lighting style and use of colour palette. I choose to do this as well as looking at research material, because there is no other better way to analyze films colour palettes and lighting style then by watching the movies themselves.